The Brewers took care of business last week. After treading water against their National League Central competition, the Milwaukee Nine had an opportunity to bank some wins and they did not disappoint. After losing the opening game of their series against the Cincinnati Reds, the Brewers closed out that series with two straight wins, then swept a four-game series against the visiting Miami Marlins. The six-game winning streak has propelled them into a tie for first place in the division with the St. Louis Cardinals. 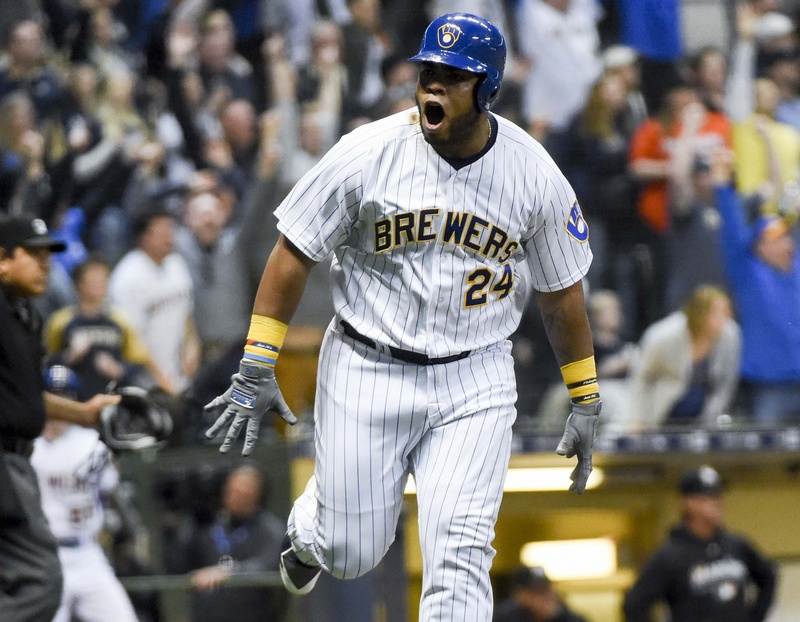 On Saturday, Jesus Aguilar put together one of the most memorable at-bats in recent Brewers history. Leading off the top of the 9th inning a tie game against Junichi Tazawa, Aguilar had a thirteen pitch at-bat, which ended with a walk off home run. Aguilar fell into an 0-2 count, but he managed to fight back and get himself into a situation where he got a great pitch to hit. Tazawa is a three pitch pitcher, using his four seam fastball a little more than 50 percent of the time and using a curveball and splitter to put batters off balance. However, there are patterns to his pitch selection. If Tazawa is going to throw a curveball, it’s likely to be the first pitch of the at-bat, which he did here. Afterwards, the threat of the curve diminishes. Tazawa did not return to the curveball in this at-bat, even though he placed it for a strike to start Aguilar off. The next twelve pitches of the at bat were fastballs and splitters, with one throwaway slider thrown for good measure. While he hasn’t had as many starts as his performance would warrant, Aguilar’s plate discipline stats have moved in a positive direction this year. He’s making contact on 78.69 percent of his swings, which would be a career high and more than a 10 percentage point jump from 2017. In addition, his swinging strike rate has plunged to 21.31 percent from 33.06 percent in 2017. Those traits were on full display during this at-bat. 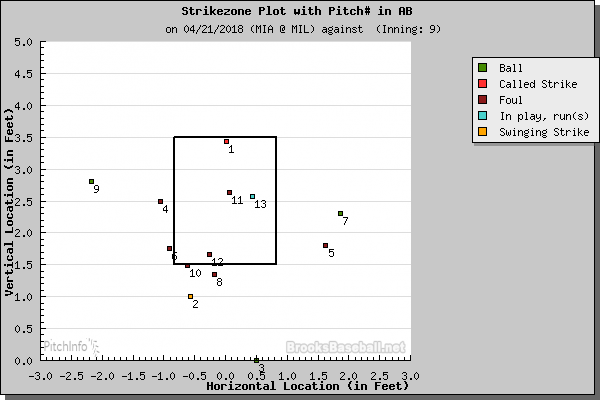 After he looked at that first pitch strike, Aguilar had to swing nine times to keep himself alive, and he only whiffed once, on the second pitch to go down 0-2. Aguilar swung at a few pitches outside the zone, in particular that fifth pitch slider which he probably wasn’t expecting to see, but he fouled off so many pitches that he forced Tazawa back into the zone. After ten pitches, Tazawa went to his fastball and decided to sink or swing with his best pitch. He threw two fastballs belt high, over the middle of the plate. Aguilar fouled the first one off. When he saw that pitch again, well. Aguilar knows how to handle a fastball in that location. Before only registering a pinch-hit appearance on Sunday, Eric Thames had one hit in every game of the winning streak. Thames will never be a high average hitter, but he’s currently running a .344 TAv, and smashing the ball when he makes contact as evidenced by his 4th place ranking in MLB in Barrels per plate appearance, as per Statcast. This season Thames has increased his swing rate from last year, while staying below his rate in his previous unsuccessful MLB stint. He’s also decreased his whiff rate on breaking and offspeed pitches, which is important because pitchers have finally corrected themselves and started throwing those pitches more often. However, right now Thames is hitting everything in the strike zone and isn’t showing any obvious weakness on pitches he can’t handle outside of curveballs. Last year, there was a clear plan of attack to throw away from Thames because he would chase. So far in 2018, Thames hasn’t shown an obvious hole on outside pitches, though he is whiffing more on pitches high in the zone. That’s an area where he wants the ball though, because it goes far when he connects there. This slightly more disciplined version of Thames is a better hitter than last year, even if he isn’t quite at his April 2017 destroyer of worlds apex. The Brewers hit the road again this week. Their first stop will be Kansas City for a two-game series with the Royals. It’ll be the team’s first visit to Kauffman Stadium since 2015. The Royals just split a four-game series with the Tigers and currently have the third worst run differential in the American League. Afterwards, the Brewers will travel north to face the third place Cubs in Chicago.